You see I live in something we call a 'conscious community house'. And what the heck is a 'conscious community house'? I can almost hear you asking! Quite simply it is a house where we live with the conscious intention of living in loving kindness. We have made a pact with each other and ourselves that we will live not just with one another but for one another. I have lived, over the years and through my wanderings, in a number of quite different living situations and I can tell you that never have I felt more at ease and more at peace than in my little house...that I am soon to move on from...Even though there are 6 of us in the one house! It is amazing that when the intention of a house is positive - to care for one another, honour and respect one another - that the dynamic is completely different than when this isn't a conscious intention. Because although most of us are good people, it is naive to think that this loving kindness simply happens. It may...but so often it does not. Unless we think of things, bring them to cognition and act upon and with them they won't necessarily become real. This is a topic I mention a lot in Choosing You! : How You Can Choose To Live The Life Of Your Dreams...Right Now! - how we have infinite power in our ability to choose and that when we choose the right path for us and act upon it, the results can be life (and world!) changing. The intention of loving kindness, non-judging compassion and having conduits for conscious communication can change our whole living dynamic! This has amazing connotations for not just our mental and emotional health but for that of the planet too. The economies of scale provided by the sharing of space (i.e. more people in a house) create a veritable boon to the environment; in reduction of waste, emissions and consumption. If more of us could live like this environmental damage would be significantly reduced. But many of us cannot fathom the idea of living with more than one or two others..and this is a point I can understand having seen both sides; from owning, and living on my own in a 3 bedroom + house in a very nice suburb in Auckland, through to living with 5 wonderful, amazing healers and spiritual warriors in a nice suburb in Vancouver, BC! There are advantages to both, but when the latter is approached with love, with compassion and with non-judgement any negatives evaporate away. Barefoot Walker Accosted by Police! Walking up the hill near my house towards 4th Avenue in Kitsilano I felt that 'strangeness' you feel when someone is watching you. Glancing to my left I noticed a Police car driving ever so slowly up beside me. Figuring they were just cruising slow I kept on walking, whistling and singing away as I strolled up the hill - barefoot of course. Then the cruiser pulls in front of me and a young officer steps out of the passenger side. "How's your day going sir?" to which I replied "Great thank you, and how about yours?!" "Fine...So....what's with the 'no shoes'?" I'm thinking: 'Wow, I got stopped by the cops for not wearing shoes!...That's kind of cool!'. So I dutifully outlined for him why I don't wear shoes. As I did so he plainly became aware that I wasn't a) drunk, b) on drugs or c) a crazy homeless person that could have also been 'a' and/or 'b'. Officer: "Cool, we just don't see many people not wearing shoes!" Me (with a big smile of course! ): "And you thought 'Who is this crazy dude walking around barefoot'"
Officer: "No, no, not at all...we just wanted to see...uhhh..what was up. Sorry for the inconvenience. You have a great day sir"
Me: "No problem man, you have an awesome day too!" Funny as hell...and really made my day! Email chain letter that's actually worth reading! One day, when I was a freshman in high school, I saw a kid from my class was walking home from school. His name was Kyle. It looked like he was carrying all of his books. I thought to myself, 'Why would anyone bring home all his books on a Friday? He must really be a nerd.' I had quite a weekend planned (parties and a football game with my friends tomorrow afternoon), so I shrugged my shoulders and went on. As I was walking, I saw a bunch of kids running toward him. They ran at him, knocking all his books out of his arms and tripping him so he landed in the dirt. His glasses went flying, and I saw them land in the grass about ten feet from him.. He looked up and I saw this terrible sadness in his eyes. My heart went out to him. So, I jogged over to him as he crawled around looking for his glasses, and I saw a tear in his eye. As I handed him his glasses, I said, 'Those guys are jerks, they really should get lives.' He looked at me and said, 'Hey thanks!' There was a big smile on his face. It was one of those smiles that showed real gratitude. As it turned out, he lived near me, so I asked him why I had never seen him before.He said he had gone to private school before now. I would have never hung out with a private school kid before. We talked all the way home, and I carried some of his books. He turned out to be a pretty cool kid. I asked him if he wanted to play a little football with my friends - He said yes. We hung out all weekend and the more I got to know Kyle, the more I liked him, and my friends thought the same of him. Monday morning came, and there was Kyle with the huge stack of books again. I stopped him and said, 'Boy, you are gonna really build some serious muscles with this pile of books everyday!' He just laughed and handed me half the books. When we were seniors we began to think about college. Kyle decided on Georgetown and I was going to Duke. Boy, sometimes I was jealous!...Today was one of those days. I could see that he was nervous about his speech, so I smacked him on the back and said, 'Hey, big guy, you'll be great!' He looked at me with one of those looks (the really grateful one) and smiled. 'Thanks,' he said. and steal my way into your arms. that I will break soon, so soon. as I seek the warmth of your embrace, to shelter from the cold. I stay locked in your arms. But that hold me still, and tight. and on your face, lighting your innocence too. I had been boxing with the great NZ coach Chris Martin out of the same Auckland Boxing Association stable that included Paula Mataele – at the time the Super Heavyweight Champion of New Zealand. After suffering several concussions during sparring, and having already sustained quite a few playing rugby over the previous 14 years I had been faced with the prospect of giving up my goal of becoming an international fighter. I was pretty despondent about this, and to be honest I needed a new challenge. I had always had a fascination with the seemingly superhuman levels of strength exhibited by people like Arthur Saxon, Herman Goerner, Geoge Hackenshmidt, Joe Greenstein and others. I had also never been truly strong. As I researched the old time strongmen and became more and more interested in 'All Round Weightlifting', one name stood out, and kept popping up in the competitions of the time as one of the greats of lifting – Steve Angell. The lifts that Steve put up in competitions became the weights that I attempted to meet (pound for pound) and became a focus for me in my early days of strength sports. Years later and having competed in both All-Round and Olympic weightlifting it is my absolute pleasure to now know and be able to 'shoot the breeze' with the man that was my inspiration to enter into competition. And it is my pleasure to introduce him to you. Cliff Harvey - Hi Steve thanks for agreeing to talk with us. It's a real honour! Steve Angell - The pleasure's all mine Cliff, I'm honoured that you feel me worthy of an interview. CH – Thanks. Steve - I'm sure many of my readers will be aware of your accomplishments, but for the rest can you give us a little bit of your background and history in the iron game? SA - Well it all started for me in Athletics. I was a hammer thrower who needed to get stronger for the event. I have been Buckinghamshire County Hammer Throwing Champion as a Junior, senior and in 2009 came out of retirement to win the senior championships as a 35-39 year master. My need to get stronger for throwing led me to train at a great old school type gym in my area. 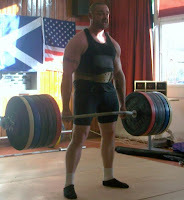 The guy who ran the gym (Brian Clayton) saw the potential in me as a powerlifter and after just over a year of serious training became Junior British Drug Free Powerlifting Champion and I broke the British Deadlift record by 40kgs, recording a lift of 280kgs at 90kgs bodyweight. The venue for the competition was Steve Gardner's powerhouse Gym, and there we formed a friendship that would mould my All-round lifting career. There was a picture on the wall of Steve's gym of him performing the stone putt in a Highland Games competition. As a thrower this got my juices going, and upon talking to Steve found out he ran strongman and Highland Games competitions. I talked Steve into letting me compete in his next Highland Games competition, and as the youngest guy there, won the games. I became a multiple World Champion in the All-Rounds and in the last 20+ years have competed in just about every type of strength sport I could find. A rundown of my achievements are as follows. CH – That's quite the wrap sheet Steve! Out of all the things you've done what are you most proud of? SA - The thing I am most proud of, and it was emotionally the hardest thing I have ever had to do was back in September 1996. Just six days before I was due to compete in the World Championships in Glasgow Scotland, My father passed away from cancer. My mother and brothers and sisters wanted me to go to Scotland and compete. 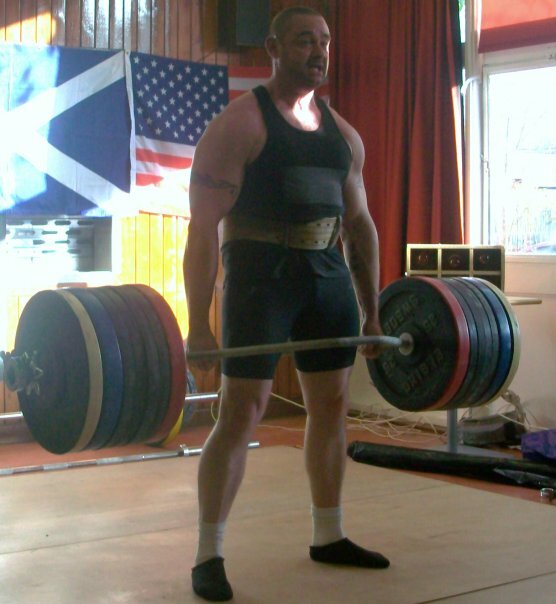 It was hard for me to travel to Scotland, but my weightlifting family helped me through it. I won my weight class and best over all lifter award and broke six world records. I am very proud of all of the above as far as winning titles goes. The lift I am most proud of is my 255kgs Zercher. i did this lift at 102kgs bodyweight in 1997, and twelve years later it is still the biggest lift ever done regardless of bodyweight. A lot of the things i am most proud of are what I call 'off the cuff lifts', where I did no prior specialist training. They are a 1660lbs Hand & Thigh lift performed in Frank Ciavattone's basement in Boston USA. We just loaded up the bar to see what I could do. I also Closed an Ironmind No 3 Gripper on site. A guy brought one along to an all-round competition and I closed it. I also Lifted the Dinnie Stones 5 times with no prior training. In fact the lifts were the day after the 2001 IAWA world Championships held in Glasgow Scotland. I had performed 8 lifts over two days and was quite beat up, and after winning my weight class and best lifter award, was a bit worse for ware after celebrating with my Old friend Jack (Daniel's) on the Sunday night. Never the less, after a 4hr drive to the stones, I lifted them 5 times. I have been back to them since and lifted them a further 4 times. So Steve I'm interested to hear the story of how you 'tamed the BEAST'! SA - That's one of the hardest off the cuff strength feats I have ever done. Recently I cleaned every rep and pressed a 48kg kettlebell for 100 reps (50 left & 50 right handed) For some reason a 48kg ball with a handle has gotten the name "THE BEAST". To me that's just a marketing ploy from Dragondoor, but also it's setting limitations in peoples mind sets. 100+ years ago, strength Athletes gave us the Dinnie Stones, The inver stone, the Inch Dumbbell and the Apollon Axel. They were "BEASTS" to lift, not a 48kg kettlebell. CH – Ha ha – that's great stuff Steve. Too many people put limits on their performance. So talking about limits what are some of your best lifts in competition? SA - I have always been a platform lifter. By that I mean all my PB's have been done in competition and not in the gym. My best lifts ever are. I think they are some of my best lifts. Although I did a training phase once doing half front squats out of the power rack and worked upto 800lbs. My coach at the time (Brian Clayton) said it was the best feat of strength he had ever seen drug free. CH - You were certainly a big inspiration for me when I was first entering into weightlifting competition. who were some of your role models in strength sports? SA - Thanks Cliff, that means a lot to me. My hero's if you like were (to start with) Bill Pearl and Bill Kazmaier. I brought a copy of a bodybuilding magazine back in 1986 when I was 16 years old. There was an article about Bill Pearl in it and he was 55 years old at the time. He looked amazing and to this day, i have that magazine at hand to inspire me. Kaz was just a "BEAST" and I loved everything about him. I set out to be the next Kaz. If you see me getting psyched before a lift, it is modelled on Kaz. The two Bill's are still hero's of mine. On the lifting scene a bit closer to home, I have a lot of people to thank for helping me become the best I could be. They include. My first coach Brian Clayton, My hammer throwing coach Jack Kee. My wieghtlifting Coach Chris Gladding, who is a second father to me. Steve Gardner has played a big part in encouraging me during my lifting career. Just seing some of my fellow lifters compete has inspired me. Just a few names are - Frank Ciavattone, John Vernacchio, Neil Abery, Howard Prechtel and Denny Haybecker. Outside the lifting arena, my heroes are Mohammed Ali, English decathlete Daley Thompson and Liverpool football player Kenny Dalglish. And the greatest English Rugby player of all time Martin Johnson. CH – Well being a Kiwi and rugby fanatic I won't comment on Martin Johnson mate! But I think we can agree on the rest of the legends you listed. You are heavily involved in kettlebells now - can you tell us a little about how you became involved with the UKKA? SA - In 2003 I became the youngest English inductee into the IAWA hall of fame. Steve Gardner put a great evening of entertainment on for the inductee dinner, and one of the the people he booked was Stan Pike, the founder of the UKKA. He did a kettlebell demonstration and i was just instantly hooked. I had seen pictures of kettlebells being used by old time strongmen and just fell in love with them. After the awards ceremony, I chatted to Stan and we hit it off straight away. We were like two old warrior spirits meeting again after a millennium. Steve Gardner got Stan to come back to his gym so we could have a play with the bells and I purchased a 16, 25 and 32kg kettlebell from Stan on that day and spent some time using them to warm up prior to my lifting sessions. I then contacted Stan about becoming qualified as a UKKA instructor. I travelled up to Scotland a few times over the next year and our friendship grew, as did my kettlebell collection. I now own KB's from 6kgs through to 56kgs and I truly believe Stan's 'IntenseFitness' kettlebells are the best designed bells in the world. After my training with Stan, I was proud and honoured to be invited to become a senior Instructor with the UKKA. I now train personal trainers and certify them to become instructors. I truly think kettlebells are the best training tool out there, but they are not the only tool. I incorporate them into a well balanced strength and conditioning routine. As a strength athlete, I use kettlebells, sand bags, rocks and stones etc to turn the strength I gain from free weight and machine training into functional strength. for instance, I could work up to 150kg seated press on my powertech plate loaded machine and then perform up to 100reps pressing a 48kg kettlebell. I also love using kettlebells for circuit conditioning training. I perform 5 x two hand swings, 5 x one hand swings each hand, 5 x snatches each hand, 5 x clean and presses each hand, 5 x Fig 8 each direction and 5 x pass around the body each direction. i would warm up with a 16 kg, then work through 20, 25, 32, 40, and 45kg kettlebells. "The state of the fitness industry"
SA - It's full of under qualified instructors. By that I mean under qualified in experience. It's very easy to qualify as a personal trainer if you have a couple thousand pounds (or dollars) to spend, but I have to be honest, I would not pay most of the people who have come to me to qualify as a KB instructor to train my cat let alone myself. On paper most of the people I have put through their KB instructor courses are more qualified them me, but in a lot of cases they have become clients of mine because they can't even (or have not been taught on their courses how to) squat correctly. I had one trainer want me to put them through a strength session. I was just ready too beast him because I automatically thought technique would be fine. The first session ended up resulting in me teaching a trainer who had spent around £7,000 on training courses the basic squat techniques. I gave up on qualification when on my PT instructors course. They (WABBA) said there were only three exercises that trained the hands, wrists and forearms. The reverse curl, wrist curls and wrist roller. I wrote loads of exercises on my written exam amd they failed me. I went mad at the guy running the course. He wrote the answers they required on a piece of paper, handed it to me and said if your paper has these answers on it you will pass. I filled the papaer out, got my qualification - and it is the most worthless piece of paper I own. I think that just about sums up the closed mindedness of the industry as a whole. CH - "Kettlebells in the industry"
SA - Too many people in it to make a quick buck. Just about every man and his dog seems to be an expert in KB's and bringing out very poor DVDs. When i started kettlebell training, bought lots of DVD's and books trying to gain as much knowledge as possible. How ever most of them seem to be trying to think up new exercises just to bring their next DVD or book out. Just the same as everyone knows that deadlifts, squats, cleans, presses etc are the best compound type exercises to perform using barbells. Swings, snatches, cleans, presses along with some core type exercise like turkish get ups are the best kettlebell exercises to perform to gain the best results. Everything else is just an add on to your training after you have performed the basics. CH - "Instability devices (bosus etc)"
SA - Deadlift 3 times bodyweight without a belt and you will have all the core stability you will ever need. The picture of you sitting on a bosu ball writing your training diary sums up their worth. Just stick to basic heavy compound movements, supplemented with kettlebells, sandbags etc and you will get all the core stability you need. CH – Thanks Steve! We got a lot of use out of that pic! SA - I like to work on the KISS theory when it comes to Nutrition. That is 'Keep It Simple Stupid'. I keep my nutrition simple and balanced. I like the theory I was taught when I studied the basics of nutrition. "If man has made it or tampered (processed) with it. Limit it or eliminate it from your diet all together." When I made my mini comeback last year and go my deadlifts over 300kg again, I supplemented with more protein than I had before. On top of my meal plan, I was taking 30 grams of protein in a drink four times a day. I found this very useful in recovering from intense workouts. Other than that, I take a high potency Multi Vitamin, 2 grams of Vit C and B complex Vits daily. CH – I agree Steve – and I use that analogy ('if man made it don't eat it') a lot in my lectures too. You have been called a 'spiritual warrior' can you tell us a little about the role faith plays in your daily life? SA - I read a quote in a book once from a Buddhist Monk that kind of sums up my religious faith. He said he loved Christ and Christianity, but was not so keen on 'churchianity'. That sums me up quite well. I am a very spiritual person, but not mega religious. I believe in and love God, but also believe in the teachings of Buddha. Christ and Buddha are the two most peaceful people to have walked the earth. Once politics has been removed from the teachings of both of them, you come down to the fact that they both just wanted people to live in harmony, help one another and remove greed from their lives. What a great world it would be if that ever happened. CH – It sure would Steve, great thoughts there. If more people would recognize the fundamental truths of faith and culitivate their own connection with God, 'The Divine', 'The Superconscious' or whatever you want to refer to it and stop just trying to be 'right' the better off the world would be. So along those lines you've also become more heavily involved in yoga and tai chi lately. How did you come to be involved with those? SA - I had my best ever year lifting in 1997. I was British champion twice, world Champion, did my 255kg Zercher and 230kg One Hand Deadlift and won Britain's Drug Free Strongest Man competition. However all that obviously took its toll on my body, as in my first Competition of 1998 my back blew out on me. The heavy one hand deadlifts had compressed the lumber discs and to cut a long story short it took two years for me to recover from this injury. Part of my rehabilitation was me purchasing a yoga video for back health. I learnt the exercises on the video and carried on doing them for a few years. Then I took on a client who started telling me about a yoga holiday that she had just come back from run by a guy called Simon Low. My wife had just started getting into yoga at the time and when I told her about Simon Low yoga retreats, she looked him up on the internet and before I knew it had booked us on his next retreat. That was a great retreat and I made a good friend in Simon Low during that week. He admitted to me that when he looked at me as a 240lb weightlifter, he wondered what on earth I was doing on one of his retreats, but I kind of proved to him during that week that you can be very strong, but be flexible as well. With all the meditation, chanting etc we did during the week and me Om-ing with the best of them, I came away from the retreat with the new name, "Peaceful Warrior". I now have that tattooed on my arm. CH - How have these experiences changed your outlook on training and life? I have become a more balanced person with yoga and tai chi. Tai chi has taught my the Chinese yin and yang philosophy of hard (strength training) and soft (yoga and tai chi) and that the body works best when they are in balance. I am still very much a yang (hard) man, but try and create as much balance as possible. I also know, I will turn my back on the strength world one day and yoga and tai chi will become the foundation of the remainder of my life. CH – I've certainly found the same Steve. I was introduced to yoga growing up with my Dad and more recently have gotten back into it and I both love it and feel that it for me to provides the 'yin' to the 'yang' of lifting and fighting. Looking back over your career how have you evolved as a lifter?...and as a person? SA - I will be 40 years old in 2010 and I believe I am a better all-round athlete and person than I was in my twenties. That is because I have introduced more conditioning in to my training as well as yoga and tai chi. In my twenties, I was just a beast with the aim of lifting more in each competition. Looking back, never really enjoyed the moment with all my victories. As soon as the Gold medal was in the bag, I was thinking of the next. My father even said to once that I should sit back and realize what I achieved. It wasn't until 1997 when my body could not take anymore beatings and subsequently I had to take two years out to rehab my back and body that I started bringing more balance it to my training. In 2001 / 2002, I had lost that balance again and despite being the strongest I had ever been, I took it too far again and completely detached my right distal biceps tendon. I had to have surgery to reattach it and another year to fully recover from the injury. It was then that I took a step back and could see what I was doing to myself and my wife and family. I retired from International competition in 2002 and that is is when I added boxing training into my routine and then the following year met Stan Pike and was introduced to kettlebells. From there my training has become much more balanced. I always felt I was only six months real hard training away from being able to hit big poundage's again though. And this was proved right in 2009 when I competed in my County Championships at Hammer throwing after a break of 13 years and won the Gold Medal and then after 10 weeks heavy training broke the IAWA Trap -Bar Deadlift World Record pulling my first 300kg deadlift since 2002. CH - What are you working on right now Steve? Any new projects on the way? SA - 2009 was a bit of a comeback year for me winning the County Hammer throwing championships and deadlifting 300kgs again. The real inspiration behind this was my daughter Ella. I wanted to win medals and trophies for her, so she would know her daddy was at one time one of the strongest drug free people in the world. She really is my inspiration now. And also I have to stay big and strong to keep the boys at bay when she gets older Ha Ha. As I stated earlier, I will be 40 in 2010 and I wanted to do something mad to celebrate my 40 years on the planet. I am sharing this goal with you exclusively in the interview. As you know I have a love for stone lifting and the most famous stones in the world are the Dinnie stones in the highlands of Scotland. I have visited them twice, lifting them 5 times in 2001 and four times in 2007. For my 40th I am going to attempt to lift them 40 times. This is the biggest (and craziest) goal I have ever set myself. In the fourth rep back in 2007, I tore the skin from my hand and was unable to attempt any more reps, so I am going through some very strict training for this goal and am videoing my training and the attempt its self and if successful will be bringing a DVD out of the whole thing. As you say Cliff, “if you shoot for the stars and reach the moon, you have still had a great journey”. With this goal I am shooting for the stars and am very much looking forward to the journey. CH – Wow Steve, that is one hell of a goal! Thanks for sharing it with me and my readers. If there's anyone who can do it, it's you mate. Thanks again for taking time out of your busy schedule to talk to me mate. It's an honour and a pleasure to be 'singing from the same song sheet' as you would say. Easter and the dark night. This Easter I am reminded of the 'dark night'. That concept where we can so easily define ourselves, our lives and our direction out of moments and times of great hardship and grave calamity. In the Easter story when Jesus is on the cross he cries out to God saying "My God, my God, why have you forsaken me..."
And we can see that this moment was the dark night, a night split by a cry of abject disillusionment, loss and heartache. And in that moment of heartache, of total and utter despair, Jesus surrendered and yielded up his spirit to God. Forsaking not life, but forsaking the attachment to the end result of action saying; "Father into thy hands I commit my spirit". This surrender is a common theme amongst spiritual traditions - the dark night of despair and the eventual transcendence of this through surrender to a higher power. Whether we call this higher power 'the Divine', 'God', 'the Superconsciousness' or simply love or truth matters not. What does matter, and what is so powerful is the recognition that there is something more than what we know and understand through the standard Cartesian paradigm. We can all, I think recognise that we are linked in some way, and what more is that link than that something greater? I have had the question asked "Doesn't surrendering to something outside of us excuse laziness and inaction?". My answer to this is an unequivocal NO! It has been said that God helps those who help themselves, and of course without action words and thoughts are moot. We are after all defined by our actions. This surrender I talk of is not inaction! It is instead acting in purity, acting with honesty, loyalty, humility and most importantly LOVE. It is following your path with compassion, and living it to the best of your ability. This is work ethic in it's purest form! But in surrendering we let go of attachment to outcomes. We accept that in the good things and the bad of life, there is meaning, there is learning and there is experiential joy in each and every breaking moment. We realise the truth of the now in surrendering our attachments and becoming truly comfortable, and truly happy in the knowledge that what will be will be. ...and I can't help but have this wonderful feeling that when we surrender to this we allow ourselves to return home, and we find ourselves beautifully en-wrapped in the arms of God.